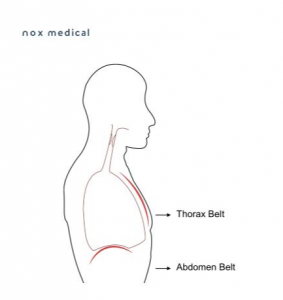 This info sheet is an introduction to the Nox RIP belts and will explain the benefits of using two belts to measure breathing effort during sleep. The information below will shed more light on this important subject. To understand diagnostics of sleep disordered breathing, one must first understand the principles of breathing. Simply put, the main purpose of breathing is to move air to and from the lungs for normal gas exchanges to occur. During inspiration, the lungs must expand and for that to happen both the rib cage and the abdomen must expand. In normal breathing, the diaphragm is the main driver for lung expansion, followed by the external intercostal and scalene muscles. Expiration, on the other hand, is mostly passive, relying on the elastic recoil of the chest and abdomen to push the air out. During forced expiration the internal intercostal muscles and abdominal muscles can also be recruited for expiration as well (Guyton & Hall, 2006). 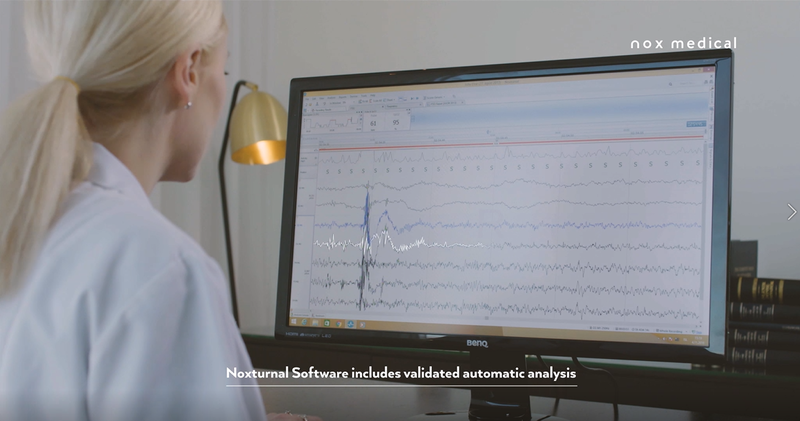 Nox Medical‘s systems include two RIP belts for each sleep study to help the specialist measure breathing effort during sleep. The gold standard technology used in the respiratory effort belts, is the so-called RIP (Respiratory Inductive Plethysmograph). In this technology the belt typically contains a conductor that, when put on a patient, forms a wire loop that creates inductance that is directly proportional to the absolute cross-sectional area of the body part that it encircles. bWhen this kind of belt is placed around the abdomen or thorax, the cross-sectional area is modulated with the respiratory movements and therefore also the inductance of the belt. By measuring the belt inductance, you get a value that is modulated directly proportional with the respiratory movements. RIP technology is therefore an inductance measurement of conductive belts that encircle, importantly, both the thorax and abdomen of a patient. Figure 1 The picture above shows how the rib cage and the abdomen expand during inspiration. 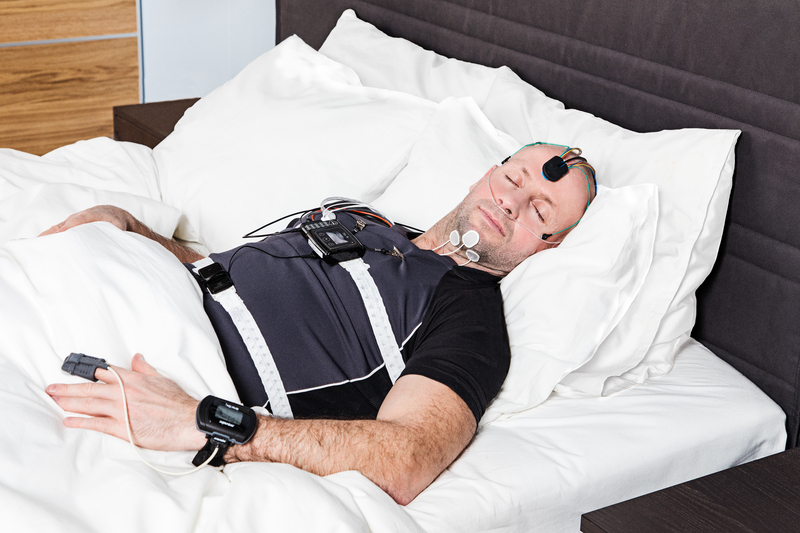 Using two belts in a sleep study has considerable advantages for diagnostics. First and foremost, this gives the specialist a vital tool in estimating flow (Sackner et al., 1989) which could not have been made possible with only one belt. Additionally, being able to observe both ventilatory degrees of freedom gives the clinician a good picture of the patient‘s breathing during a sleep study. As previously discussed the patient can breathe through two different mechanisms: by “expanding the chest“ and breathing “into the stomach,” having two points of reference catching these mechanism is therefore critical during a sleep study. This becomes even more vital when there is abnormal breathing taking place. Furthermore, using this method of assessing breathing disorders is essential in distinguishing more precisely between central and obstructive apneas. The nasal cannula and/or thermistors are most often used in measuring flow during sleep diagnostic tests (Berry et al., 2018). The flow and pressure is gathered from the patient’s nose. Known limitations to this method are listed below. During periods when a patient breaths through the mouth, the cannula is inadequate in measuring and accurately estimating the patient’s flow. In other words, if the cannula is the only source of flow information during a sleep study, mouth breathing could be confused with hypopneas or apneas. Using two RIP belts along with the cannula in this case can provide the clinician with much more valuable information. Cannula signal failure can in some cases be more than 30% (Jönson Ring, Markström, Bazargani, & Nevéus, 2017). This problem could be in the form that a patient removes the cannula while sleeping or the cannula gets displaced. This can be a very significant problem which in some cases requires patients to undergo a second sleep study. This increases the waste of resources and decreases operational efficiency. With the Nox devices and Noxturnal, it is possible to utilize the RIP belts as a backup signal for the cannula. As mentioned above, the two RIP belts provide an excellent insight into the patient’s condition as they can give the clinician an estimate of flow during a sleep study. Using only one belt and the cannula it can be difficult to estimate the effort of the patient‘s breathing during apneic and hypopneic episodes. As mentioned above, expanding the lungs takes effort of the diaphragm and other breathing muscles, which are responsible in both elevating the chest and expanding the abdomen. Measuring this phenomenon only at the thorax could miss the full estimate of the effort from the diaphragm. Berry, R. B., Albertario, C. L., Harding, S. M., Lloyd, R. M., Plante, D. T., Quan, S. F., … Vaughn, B. V. (2018). The AASM Manual for the Scoring of Sleep and Associated Events. Guyton, A. C., & Hall, J. E. (2006). Textbook of Medical Physiology. W B Saunders Co.